"Satori" redirects here. For the species, see Satori (Species). Master of the Palace of the Earth Spirits, Anonymous book writer. Satori Komeiji (古明地　さとり, Komeiji Satori) is the Mistress of the Palace of the Earth Spirits after the underground city was separated from Hell. Her ability to read minds causes various youkai and spirits to fear her, but makes her loved by the animals that normally can't be understood. With these animals as pets, she manages the ruins of the Hell of Blazing Fires where her home stands. She first appeared as Stage 4 Boss in Subterranean Animism, then she was Stage 9 target in Double Spoiler. Satori Komeiji is, as her namesake suggests, a satori, which means she has the power to read minds. The satori are particularly detested, even among the other youkai currently living in Former Hell. Her palace never gets visitors, because no one wants to visit her. Even Kanako Yasaka felt the need to go behind her back to get control of the Hell of Blazing Fires, as it would be impossible to negotiate with her. Not much is known about Satori's actual personality. 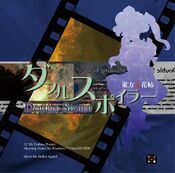 When the heroine arrives at the Palace during the events of Subterranean Animism, she is very suspicious, and decides to fight against her by using danmaku patterns in the heroine's own mind (or that of her partner). However, she appears to be loved by animals, as they can't normally be understood in the first place. As a satori, Satori is capable of reading the heart and mind of any living creature, even vengeful spirits. This ability works only on those within her immediate presence, and doesn't work at all on her sister, Koishi. Satori has limited hypnotic abilities, allowing her to bring traumatic memories to the surface of a person's mind or induce amnesia. After successfully "awakening trauma" through her hypnotic abilities, Satori is able to tap into her target's memories and use patterns they have seen in the past - i.e. Spell Cards that the player character has fought against in a previous game. This is a true recreation, not an illusion, but is not completely exact (possibly due to flaws in the source memories, or Satori lacking the original users' abilities). When the Yamas moved the actual site of Hell away from the Underground, there were many vengeful spirits left over that needed to be controlled. The Palace of the Earth Spirits was built on top of the ruins of the Hell of Blazing Fires, and with Satori as the mistress of the palace, there was no chance of any kind of revolt. Eventually, Satori delegated various roles in the maintenance of the Hell of Blazing Fires to the many pets that had assembled in the palace. Her surname Komeiji (古明地, lit. "ancient-bright earth") is an actual Japanese surname, seen mainly in the Yamanashi prefecture. The kanji 地 in Komeiji is also used in the Japanese title of Subterranean Animism (東方地霊殿). Her given name Satori (さとり) is homophonous with the name of her species, satori (覚), but written in hiragana. "Satori" could also be interpreted as satori (悟り, lit. "understanding" or "enlightenment"). Has short, purple hair with a black hairband and purple eyes. A red "third eye" is positioned over her heart, with cords running to her head and wrists. Wears a blue shirt with yellow heart buttons and pink collar, a pink skirt with faint flowery pattern and pink slippers. At some point in the past she started living in the Palace of the Earth Spirits, right above the Hell of Blazing Fires. However, her ability caused her to be shunned by humans and most Youkai. Over time, the only other residents in the Palace were her pets, who welcomed Satori's ability to read minds. Due to the difficulties in managing the Hell of Blazing Fires, she started letting the pets do some of the work. During the events of Stage 4 in Subterranean Animism, the Heroine (from above ground) invaded her home. The Heroine inquired Satori about the evil spirits and the geyser that brought them above ground; suspicious, the Youkai read the Heroine's heart, only to find that the above-ground human does not care about such things. Thus, Satori decided to test their strength. After the encounter, she permitted the Heroine passage towards the Hell of Blazing Fires to ask her pets about their supposed problem. In Double Spoiler, Satori appeared as a stage 9 target, where she uses a few spell cards and had Aya Shameimaru and Hatate Himekaidou take photos of her and her danmaku. Satori made a background cameo appearance in Hopeless Masquerade on the Palace of Earth Spirits and Youkai Tanuki Forest stage. She is seen standing around. Satori keeps many pets, including blaze cats and hell ravens, which also oversee the general management of the Hell of Blazing Fires. Chief amongst those pets are Rin Kaenbyou, the blaze cat in charge of the evil spirits, and Utsuho Reiuji, the hell raven who manages the depths of the Hell of Blazing Fires. The other important relationship for Satori is her sister, Koishi. Satori cares about Koishi, and wants her sister to open her heart to others once again. 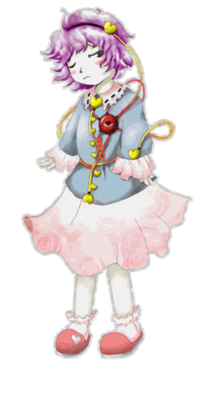 In Subterranean Animism, with the exception of her first spell card, all of Satori's spell cards are based on, if not directly stolen from, those of the players' trauma of their partners. According to the Grimoire of Marisa, she can only read what the opponent is thinking currently. Due to this limitation, she uses hypnosis in order to dig into their memories and recover their trauma. Satori is currently the only Touhou Windows character who appears before her subordinate is introduced. Satori and Koishi's design may have been inspired by the 1939 painting by Mexican painter Frida Kahlo titled "The Two Fridas". The subject is essentially two identical women (sisters/clones/twins...) with visible hearts and external arteries that seem to connect and wrap around their shoulders and arms. If her and Koishi's color schemes are inverted, they will both somewhat resemble each other. With seventy-six spell cards total in Subterranean Animism (one spell card of her own, plus three cards from one of the six player's partner, across four difficulties), Satori has more spell cards in a single title than any other character in the series. The only characters who come close are Okina Matara, with forty-six cards total in Hidden Star in Four Seasons (five first Stage 6 cards, plus four for each season final cards, across four difficulties, plus ten cards from Extra Stage across one difficulty), Kaguya Houraisan, with forty-one cards total in Imperishable Night, and each of the Three Fairies of Light individually, with forty cards total each in Fairy Wars. Satori's theme song is likely a reference to one of the background songs from the Neon Genesis Evangelion anime, "She Said Don't Make Others Suffer For Your Personal Hatred". It shares the same phrase and progression in the chorus, as well as many other musical similarities with Satori's theme, and the piece of music is originally used during a battle with the angel Sahaqiuel, a giant red eye floating in the sky with the ability to jam communications. This is also likely due to the highly psychological nature of Neon Genesis Evangelion. The underground city was separated from Hell, but a number of uncontrollable spirits remained in the former facilities of Hell, so there was a need to control them. The Palace of the Earth Spirits is built above what was the Hell of Blazing Fires, and this is where she took up residence. Since she can read others' minds, all sorts of youkai and spirits fear her, so eventually people stopped visiting the Palace of the Earth Spirits. On the other hand, her power makes her well-loved by animals that don't speak, so eventually the premises began to overflow with many pets, starting with blaze cats and hell ravens. Her great number of pets made it difficult to manage the Hell of Blazing Fires, so she entrusted parts of its management to some of her pets. Her pets would oversee other pets. Her pets would tend the gardens. Her pets would play with her younger sister. However, what shouldn't have happened did: a human came from above ground, and she was surprised when they started asking about vengeful spirits and a geyser. Satori left Orin in charge of the vengeful spirits and Utsuho in charge of the Hell of Blazing Fires. They were both loyal to Satori, so they shouldn't have done any harm. She believed there was no way they'd start some sort of incident. She thought that perhaps the human before her was spouting off lies and trying to trick her, so she read her heart and was surprised again by what she saw. There was almost nothing to be seen inside the humans' mind about the vengeful spirits or the geysers. Suspicious, Satori decided to test them. 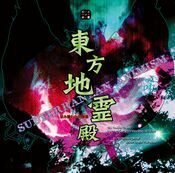 ↑ Subterranean Animism: Reimu and Suika's Scenario - "(I knew it, she can't tell what I'm thinking up here. It's so far away, I'm in a safety zone.)" ↑ Double Spoiler: Memory Sign "Brain Fingerprint" - "When there's a trace of fear deep in your heart, that's trauma. It looks like it can get in the way during your day to day life..."
↑ The Grimoire of Marisa: Satori Komeiji's Spell Card - "Danmaku usually sealed within the innermost memories are aroused by this hypnosis. This girl can surely read people's minds, but not their memories. That is why this hypnosis is necessary to awaken these traumas." ↑ Subterranean Animism: Marisa and Nitori's Scenario - "(... oh, those were my danmaku. They were ever so slightly different, though.)" This page was last edited on 23 August 2018, at 00:59.